Hamas fired thousands of imprecise rockets with the clear and lone intent to hit civilians in Israeli cities. Hamas launches missiles in the midst of civilian crowds , uses Hospitals and Ambulances for Military Purposes. Strangely, we don’t see huge European demonstrations against Hamas’ endangering Israeli and Palestinian Civilians. Political Correctness doctrine defines the Palestinians and Hamas as disadvantaged group who has the right to use violence to avenge their grievances. Even Anti-Semitism becomes fashionable again in Europe, with special support by European immigrant Muslims. 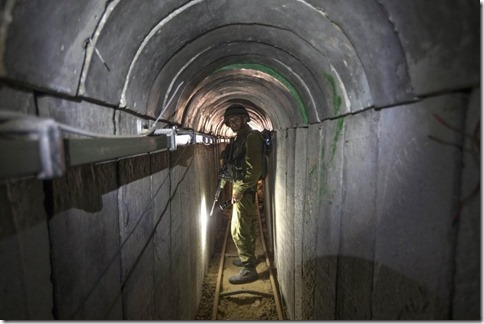 Hamas devotes money and work on sophisticated tunnels. Money that could be spent on schools, underground shelters for civilians, hospitals, food. Nobody blames Hamas for wasting money on tunnels and missiles while Palestinians above the tunnels lack even basic food and health services. Weakness is the PC (political correctness) weapon: If Israel bombs a school, Hamas wins points. So Hamas shoots rockets from schools, Israel shoots back, Hamas wins. Palestine civilians be damned, nobody blames Hamas for launching rockets in the midst of school children. Applying these legal principles to the conflict, there is strong evidence of war crimes on both sides. Hamas’ rocket attacks are illegal because they either deliberately target civilians or are fired indiscriminately. They are indiscriminate either because Hamas does not aim them solely at military targets, or their technological inaccuracy makes them incapable of avoiding civilian areas. Hamas’ actions are little different from when Allied and Axis aircraft indiscriminately fire-bombed European cities in the Second World War, or the United States dropped atomic bombs on Japan. The temptation to place necessity above the law, and self-interest above humanity, is a terrible and common human failing. Compare this to the Ukrainian Army, that had the license to attack with artillery and planes large cities in Europe, to rout secessionist that were simply hunkered down, did not lob any missiles at anyone. There was no immediate need for self defense, no negotiations were made to discuss justified grievances of the Russian speaking minority population that was suffering discrimination. Impose sanctions on UKRAINE government for shelling and their own cities and civilians, for starting an artillery war in European cities. They started the artillery war, they can stop the war any minute. Ukraine is guilty of sending war planes on attack sorties into Eastern Ukraine and scheduling civil aviation onto the same path! We demand Obama influence his Ukrainians government friends. Western journalists operating in Gaza have been threatened and harassed by Hamas for reporting instances of the terrorist groups’ use of human shields, according to a Times of Israel report. Israeli officials have noted that some reporters are intimidated by Hamas’ threats and have ceased documenting Hamas’ exploitation of civilians throughout the conflict. Israel is right to warn civilians of impending attacks. The use of human shields by Hamas is illegal, and Hamas’ intermingling with civilians endangers them. But none of this absolves Israel of its duty not to attack if civilians would be indiscriminately or excessively harmed. Over 70 per cent of casualties are civilian, including many children, suggesting a reckless disregard for civilian life by Israeli forces. Israel’s operations against Hamas are perfectly legal. Those who speak self-righteously in the name of some mythical “international community” – including the U.N. secretary general – are generally candid about their irritation. It is not really Israeli self-defense that they oppose, or even Operation Protective Edge in particular, but rather the alleged “disproportionality” of Israel’s military operations in Gaza. From the standpoint of pertinent international law, these criticisms are sorely mistaken. The legal standard of proportionality in the law of armed conflict has nothing to do with equal levels of suffering. If it did, virtually all major allied military operations during World War II would have been flagrantly "disproportionate." Properly legal determinations of proportionality can never be made in an historical or geopolitical vacuum. Instead, they must always take into account the decipherable extent to which an adversary (especially a terrorist adversary, whose every action is illegal by definition) has committed prior or ongoing violations of the law of war. In the case of Hamas, Islamic Jihad, and also “moderate” Fatah, there is incontestable evidence that these terrorists are systematically guilty of perfidy, a specific and egregious violation of the law of war involving, in this particular case, deceptions that knowingly endanger noncombatant populations. Once again, with very little objection from the "international community," Palestinian "freedom fighters" have been firing intentionally at vulnerable Israeli civilians from Gaza schools and hospitals. As for heroic Hamas leader Khaled Mashal, he prefers conspicuous safety in Qatar, to becoming a shahid, or martyr. Palestinian martyrdom is reserved by Hamas for Gaza’s endlessly manipulated and impoverished masses, those who are most plainly unable to migrate to the more pleasingly wealthy Arab oil states. Deception can be acceptable in armed conflict, but portions of the law of war, specifically the Hague Conventions, still disallow placement of civilians among military assets or personnel. Further prohibition of perfidy can be found in the protocols added to the Geneva Conventions in 1977. These incontrovertible rules are also binding on the basis of customary international law, which is included in the authoritative inventory of legal sources defined at Article 38 of the Statute of the International Court of Justice. Perfidy is identified as a “grave breach” of the law of war at Article 147 of Geneva Convention No. IV. The effect of perfidy committed by all Palestinian terrorists in Gaza – especially their widespread resort to human shields – is to immunize Israel from legal responsibility for any counter-terrorist harms done to Arab civilians. Even if Hamas and Islamic Jihad and Fatah did not deliberately engage in perfidy, any terrorist-created link between civilians and insurgent warfare would still grant Israel full justification for defensive military actions. Impose sanctions on UKRAINE government for shelling and their own cities and civilians, for starting an artillery war in European cities. They can stop the war any minute. Ukraine is guilty of sending war planes on attack sorties into Eastern Ukraine and scheduling civil aviation onto the same path!